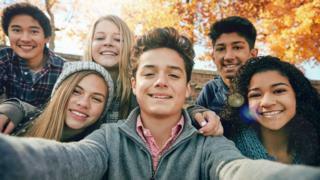 Adolescence now lasts from the ages of 10 to 24, although it used to be thought to end at 19, scientists say. Young people continuing their education for longer, as well as delayed marriage and parenthood, has pushed back popular perceptions of when adulthood begins. Changing the definition is vital to ensure laws stay appropriate, they write in an opinion piece in the Lancet Child & Adolescent Health journal. But another expert warns doing so risks "further infantilising young people". Puberty is considered to start when the part of the brain known as the hypothalamus starts releasing a hormone that activates the body's pituitary and gonadal glands. This used to happen around the age of 14 but has dropped with improved health and nutrition in much of the developed world to around the age of 10. As a consequence, in industrialised countries such as the UK the average age for a girl's first menstruation has dropped by four years in the past 150 years. Half of all females now have their period by 12 or 13 years of age. There are also biological arguments for why the definition of adolescence should be extended, including that the body continues to develop. For example, the brain continues to mature beyond the age of 20, working faster and more efficiently. And many people's wisdom teeth don't come through until the age of 25. Young people are also getting married and having children later. According to the Office of National Statistics, the average age for a man to enter their first marriage in 2013 was 32.5 years and 30.6 years for women across England and Wales. This represented an increase of almost eight years since 1973. Lead author Prof Susan Sawyer, director of the centre for adolescent health at the Royal Children's Hospital in Melbourne, writes: "Although many adult legal privileges start at age 18 years, the adoption of adult roles and responsibilities generally occurs later." She says delayed partnering, parenting and economic independence means the "semi-dependency" that characterises adolescence has expanded. This social change, she says, needs to inform policy, such as by extending youth support services until the age of 25. "Age definitions are always arbitrary", she writes, but "our current definition of adolescence is overly restricted". "The ages of 10-24 years are a better fit with the development of adolescents nowadays." Prof Russell Viner, president-elect of the Royal College of Paediatrics & Child Health, said: "In the UK, the average age for leaving home is now around 25 years for both men and women." He supports extending the definition to cover adolescence up until the age of 24 and says a number of UK services already take this into account. He said: "Statutory provision in England in terms of social care for care leavers and children with special educational needs now goes up to 24 years," as does provision of services for people with cystic fibrosis. But Dr Jan Macvarish, a parenting sociologist at the University of Kent, says there is a danger in extending our concept of adolescence. "Older children and young people are shaped far more significantly by society's expectations of them than by their intrinsic biological growth," she said. "There is nothing inevitably infantilising about spending your early 20s in higher education or experimenting in the world of work." And we should not risk "pathologising their desire for independence". "Society should maintain the highest possible expectations of the next generation," Dr Macvarish said. Prof Viner disagrees with Dr Macvarish's criticism and says broadening adolescence can be seen as "empowering young people by recognising their differences". "As long as we do this from a position of recognising young people's strengths and the potential of their development, rather than being focused on the problems of the adolescent period." What happens to my body during puberty?